Architects, interior, and exterior designers. Open source 2D CAD software for creating technical drawings, including building plans, with over 4800 CAD parts in its part library. 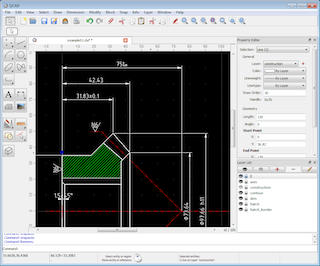 Pros: Forget about a private software QCAD works perfect for two dimension designs, you can do simple or very complex designs, the tools are very intuitive, you can use for draws or design buildings, house, kitchens, the layout and the print option are very easy to use, it is free and very powerful. Cons: It can be a little unstable sometimes, but the greatest limitation is that you can modeling anything in three dimensions, and if you want to do a render you have to use another software.